I did not conquer the Pacific. It let me go across. 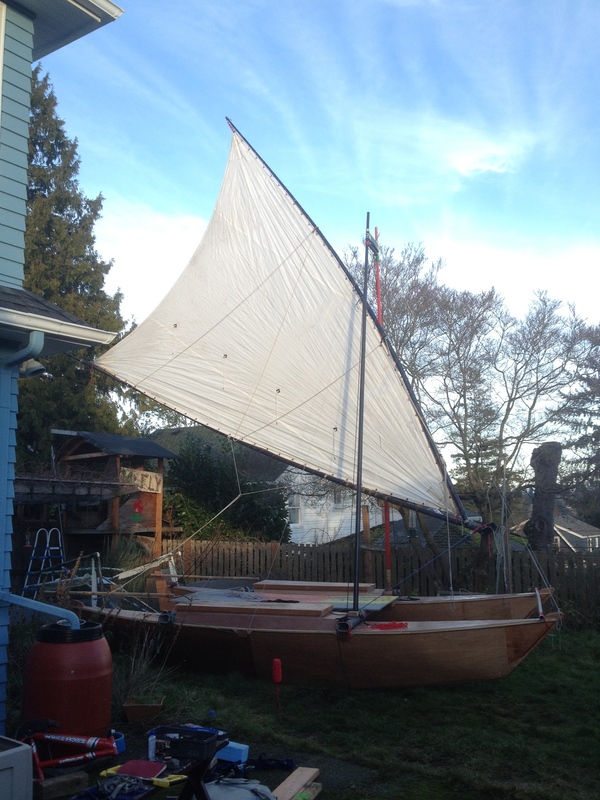 Our boat, the Manu-o-ku, is a Wharram Hitia 17′ that we custom-built for the 2015 Race to Alaska in just over a month. We have made quite a few modifications to the plans of James and Hanneke, most importantly using lighter materials and converting the lazzarettes to a sheltered place just large enough for a sleeping human. The rig is a Hawaiian sprits’l (or “crab claw”) sail on a bipod mast, optimized with help from Kiko for single-handed light-air sailing. We try to adhere to the keep-it-simple-stupid principle so we can repair our boat quickly and easily in the remote wilderness of B.C., if necessary. In addition to taking paddles (in the spirit of the Sea Runners and First Nations canoeists who have plied the R2AK route for millenia), we’ve added a pedal drive on a fore-and-aft aluminum beam, building on the great R&D accomplished by Matt Johnson during his preparations to break the 24-hour distance world record in a pedal boat. Another overarching design goal for us was enabling future mariners to build a human-powered sailboat economically and easily. To that end, we’ve recycled a mast into our beams, turned 4 windsurfer masts into our spars, field tested a tarp sail that was glued with 3M77 (no sewing), used Amsteel standing rigging, and painted with Rustoleum. Whatever happened in the 2015 Race to Alaska in the Hitia 17? Is there a write up anywhere? I saw the Hitia 17 and the Tiki 21 halt on an island for a long time, but after the race there was pretty much radio silence and I’ve no idea what happened after all that preparation. Did the Whraam boats get stuck unable to go upwind or some such? Hey Rohit — In a nutshell we spent the first week breaking stuff going into 20-30 knot headwinds and getting serenaded by sirens in a Nanaimo pub and Tribune Bay. The second week we had a blast pedaling hard and trading tacks raid-style until we ran out of time and reluctantly pulled out of the inaugural Race Towards Alaska (R2AK) in Telegraph Cove. There’s a write-up 2/3 drafted, but not yet published. I would love to read the draft.. Have many thoughts.. Did the mast break again like the bamboo one did in lake? Was it not able to make progress in 30 knot winds with the pedal drive because of being a cat (+35% power) + high windage? Did the Tiki get stuck and were you just keeping company? I want to upgrade from my tandem Alden 18 + outriggers to something more cruising style human-powered like a tandem Rowcruiser with one Willoughby style pedal system or a similar catamaran + pedal drive to your seventy48 Hitia, but as a very reluctant boat-builder I’ll probably settle for the closest off-the-shelf boat, though reading about the real-world performance, comparisons and costs here has been like candy for my soul. I am thinking about trying to build a Hitia 17. I like your idea about raising the lazarettes up higher. How high are the lazarettes? Were you indeed able to sleep in the lazarettes? Did you ever sit partly inside the lazarettes, “kayak style” to sail the boat? Did you add any structure, bulkhead, carbon fibre or anything? What was the “lighter material” and what material in the plans did it replace? About 40 cm from the sole to the underside of the hatches. Yes, it’s a nice height for paddlind canoe-style, too, with your feet down in the bilge. The full bulkheads in the plans were replaced with ring-frame made of 1/4″ ply. It’s called “door skin” here in the U.S. It’s about 2-3 mm thick instead of the 1/4″ (~6 mm) ply called for in the plans.